1995: 70-88-94 = 252 points. 1993: 72-88-90 = 250 points (21st). 17/11/1996: 77-92-95 = 264 points. 03/05/1997: 100-97-95 = 292 points. 01/09/1991: 100-98-97 = 295 points. Overall Build: Medium-size; dense stiff fur; very good flame colour, markings still obvious; correct forehead, upper head lines are sufficiently parallel; bridge of the nose slightly curved; underjaw sufficiently strong; eyes medium brown; good lips (pigment very light); short and firm back; good croup; deep and wide chest; forechest very good; good rib curvature; good angulation; strong bone; smooth gaiting; firm in the body. Nature: Spirited, natural and open. Very high protective instinct and fighting spirit, high courage and hardness with middle sharpness. Alfa von Warringhof competed multiple times in the D.V. Meisterschaft and passed the Körung 'for life' with highest possible ratings for working drives and hardness (very high protection and fighting spirit, courage and hardness with middle sharpness) and V rating. 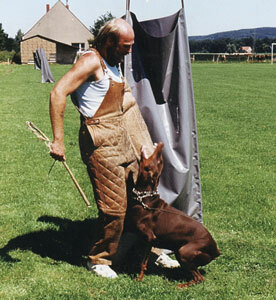 Her sire, Bingo von der Weyermühle, and dam, Dunja vom Worringer Bruch, both passed the Körung 'for life' with highest possible ratings for hardness and working drives (very high protection, fighting spirit, courage and hardness with middle sharpness). Cher: IPO 3 and dam of the von Warringhof “I, K, M, O, P” litters (Kalina, Orka, Phil, Pilar). Hel: passed the ZTP and is dam of the von Warringhof “N, Y” litters (Noami). Janka: SchH 3, FH and passed the ZTP. She is dam of the von Warringhof “O, S” litters (Sheba).